A guide to effective cueing for yoga teachers. Active language simply means your students are the subjects in your cue performing the action. Teaching with active cues allows yoga instrutors to convey certainty and deliver a foundation of trust to their students. Every asana has an intention, so be purposeful with your words to allow ample time for your students to enjoy the asana’s benefits. Over-cueing or over-describing will cause your students to overthink and lose their focus on the present moment. Your cues should sneak in and out without disrupting their practice. In order for your students to find their moving meditation, your cues should be/must be uniform and orderly. Early in my training, I found “Ninja” style cueing to be the most consistent way to formulate action. Ex: Inhale Chair pose. Lift your chest away from your thighs. Conducting the breath in a yoga class is similar to a Maestro directing a symphony orchestra. The Maestro interprets each musical score, sets the tempo and shapes the music while clearly communicating timing and phrasing to their musicians. Energy rides the wave of our breath, so in order to find peace, we must control our breath. 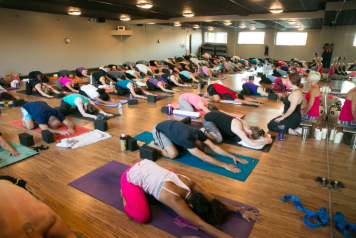 A yoga instructor establishes the breath and pace of their class to drive action with their students. The rhythm and pace from pose to pose should be deliberate. Clear, concise cueing removes interruptions and eliminates confusion to effectively direct energy. After you set the breath, call the pose before directing action. Your regular students will move directly into the pose which allows newer students to see the shape and start moving too. Then, you have the opportunity to direct their movement. Empower your students with action verbs that create a transaction in their body. Start each cue with an action verb.Use words that enable action and ownership. Active cues require less thinking and more doing! So, say what you mean and mean what you say! Specify what’s moving. Avoid cues like “the leg” or “the fingers”. Use “your leg” or “your fingers”. This changes the feel of class from universal to personal. Whose leg are we talking about anyway?! Without assigning ownership of what you want them to do, your students won’t feel connected to you or their practice. Directing your students is more efficient than describing. Describing what you want them to do doesn’t allow your students to own their movement and responses. What you do not say in class, creates space for what you do say to provide a greater impact. This cue directs action in the present moment with ownership of movement with the student. This cue is clear and concise without unnecessary filler words. Simple, active cueing will keep the momentum and rhythm of your class. On the other hand, a cue like“Inhaling into mountain pose. Reaching the arms through the ceiling into the sky.” loses the action in all the passive language clutter. Avoid leading with verbs that end in “-ing” as they function as nouns. Whereas an action verb is the physical or mental action in the present moment. Be mindful of filler words that dilute the action we want to invoke. The best way to do this is to simply breathe along with your class. Your matched breathing will keep the momentum of class and offer room for reflection. Pausing occasionally causes us to speak slower and as we speak slower, we can choose our words efficiently. Edit your words, cue to what you see in your students not what you know and hold a sacred space for a co-created experience. Our mats serve as our training ground and become better equipped to respond to life off our mats. If your directions are clear and you provide enough space, your students will be open to exploring their practice. Words that create favorable actions make positive impressions on our brains!